Our offered range of soap plants is preferably in demand for the production of the different kinds of soaps with different batch planning. We are considered as the leading manufacturer and exporter of the detergent soap plants. We cater efficiently global market with our high quality soap plants. 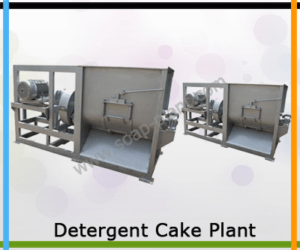 Our detergent cake plants are best example of synchronization of varied machineries. Soap making procedures are correct integration of various sequential processes starting with procedure to mix row material with color and perfume to the packing of final perfect shaped, finished soap. Material is subject to mixing, refining, and extrusion, cutting and stamping to make final toilet soap. Raw material for the detergent soap is mixed in mixer machine. Simplex plodder and Triple roller machine works for the refine and extrude function for detergent soap making. Material is extruded with vacuum. Rotary bar cutter cuts and makes bars of specific length. Foot operated stamping machine explicitly cut the bars in exact shape.